Disclaimer: the comments and opinions expressed in this review are the results of our own (limited!) experience with the product. As always, we try to provide context to give a fair overview of the product. We strive to remain impartial and unbiased, and we have not received any payment or compensation of any form for writing this article. Dagoma lent us a Discovery200 3D printer for free. Today, we’re testing the Dagoma Discovery200, an entry-level 3D printer available in kit or assembled. This review aims to give a fair evaluation of this affordable 3D printer through the 3D printing of standard 3D models, such as the famous Benchy and a nice Twisted Hex vase. Our Dagoma Discovery200 setup with Polymaker Polywood filament. Dagoma is a small French startup who successfully launched their first 3D printer in 2015, the Discovery200, based on an open-source design. Dagoma is based in the north of France in Roubaix. The Discovery200 is available in two versions, as a Kit or as an Assembled 3D printer. 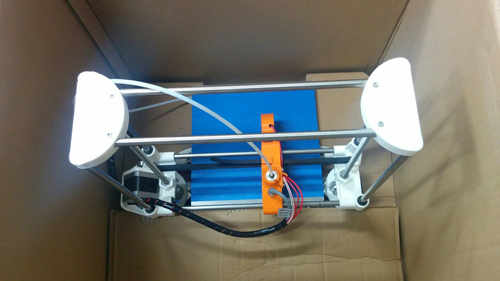 Its design is inspired by the RepRap PRUSA I3, a model known for its simplicity and robustness. For this test, the French manufacturer provided us with the fully assembled version. With a starting price of €299 for the Kit version, the Discovery200 is one of the most affordable 3D printers on the market. The assembled version is available for an additional 100€, at 400€. We received the Dagoma Discovery200 in our Tokyo lab, it was shipped in a plain cardboard packaging. The Dagoma team had handwritten a few lines and kindly provided in the package two 3D filament spools for us to test. The first one is a Wood filament from Polymaker PolyWood, the second one is standard blue PLA from the brand Octofiber. 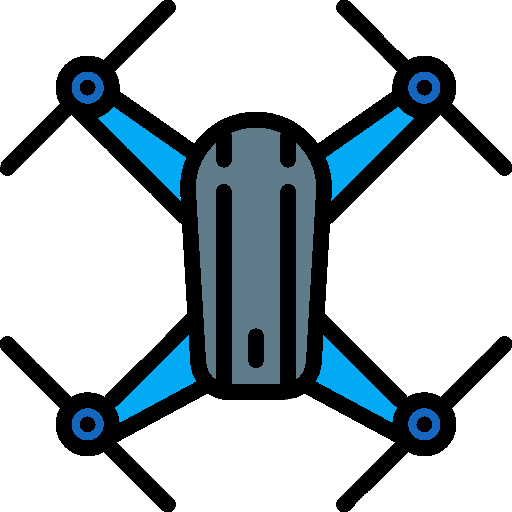 No instruction manual was provided in the box, but the Dagoma website is packed with tutorials and online explanations to simplify the use of their 3D printer. All the Discovery200 accessories are packaged in a specific cardboard box. The Discovery200 is delivered with an AC plug without worldwide adaptors, so we had to use one of our own to connect it to the specific Japanese outlets (same as US by the way). The manufacturer also provides a USB stick reader for microSD card (8 Gb is provided) and a small and very practical spatula for removing 3D prints. A BuildTak 3D print support was also provided. The Dagoma Discovery200 requires a slicing software to generate the 3D printing instructions. The manufacturer provides on their website a link to download a specific version of the Cura open source software. This software only has a few parameters available to simplify the user’s experience and avoid unnecessary parameter tweaking. The downside is that oversimplification makes is harder to manage less common uses cases, printing with exotic filaments for example. For advanced users, it is, however, possible to download the full Cura software to have access to all options. Filament spool next to the extruding engine. The Discovery200 is made from both “regular” parts and 3D printed parts. The non-3D printed parts looks a bit “cheap” and overall the Discovery200 really looks homemade (it si a kit 3D printer after all). The design could be improved on specific items. For example, the power button is located on the front and the microSD card reader on the right side. This is a bit cumbersome because both are used as interfaces to begin each 3D print. Also, in the starting position the build plate covers the power button area and you need to guess where it is. This 3D printer does not offer an LCD screen which could have been useful. One interesting design feature is the fact that the filament engine is not located directly next to the extruder but at the back of the machine, which allows the printhead to be much lighter, always interesting for a fast moving part. The filament feeder is not so easy to use and the first time it requires to use force. 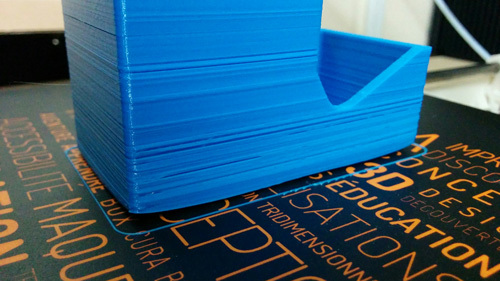 The build plate was already equipped with blue tape and ready to receive its first print. We then removed it and put the provided BuildTak. 3D printed filament spool support. Setting up the 3D printer requires to 3D print a support for the 3D filament spool. In our case, we had another 3D printer up and running so it was easy (and Dagoma kindly send us the link to download the 3D STL part). But it can be a challenge if the Discovery200 is your first machine. The Setup instructions specify the filament spool needs to placed be as close as possible from the 3D printer for an optimal extrusion speed but the extruder motor is at the back of the 3D printer, making this configuration a bit difficult to complete. We must admit we had a hard time with our first print. First, you have to understand how the “launch a 3D print” process works. 1/ You need to correctly position the filament spool and the filament to the extruder. There is no way of knowing if you did it right. 2/ You need to prepare the 3D printing instructions with Cura. The software part is OK because it offers very few options, so it is pretty straightforward. It takes some time (a few minutes at least) to properly transcript the STL file into the gCode for the 3D printer. Micro SD Card slot is difficult to access. 3/ Once the 3D instruction files are transferred on the microSD card (automatically done by Cura) you can plug the microSD into the SD card reader on the printer. It is not as easy as it seems, because the microSD is small and fragile, and the reader not clearly visible, which makes you wary of breaking/damaging the card or the reader in the process. Even after several 3D prints, this remained a tricky step for us. 4/ At this time only you may switch the 3D printer on. The extrusion head starts moving in the upper left corner and the fan begins to blow. Heating can take several minutes, and then the 3D printing process starts. If any parameter is wrong or the 3D printer is not properly calibrated, the extruder will damage the print bed surface and/or put plastic everywhere. Because we started with one of the provided filaments (the Blue PLA from Octofiber) it was easy to input the extrusion temperature parameter. The others parameters were logical but we realized that to achieve successful 3D prints we had to make some tweaks in Cura (for instance increase the first layer gap) and modify the calibration of the extruder heigh directly on the 3D printer, which is not intuitive because it requires to manipulate simultaneously two thick rods on the side of the Z axis..
Before obtaining a good result, we had to launch 5 prints with the fear that we were going to damage the extruder or the build plate. During the setup process, we actually damaged the blue tape so we had to completely peel it off and install the BuildTak that was delivered in the package. The Cura software is pretty intuitive to use in its specific Dagoma version. Not a lot of parameters to input and once we found the right settings we did not change anything. However, preparation time is very long even on a powerful PC. Once properly calibrated, the Discovery200 does produce good quality prints. From the moment we started using BuildTak, the prints came out far better with a good adherence to the build plate and fewer imperfections. One of the most painful points in the user experience is not knowing when 3D printing is going to start and the impossibility to pre-heat the extruder. Because it is required to first input the microSD card and then to switch on the 3D printer, you need to wait for the first layers to be successful (that’s when the 3D prints have the biggest chances to fail) before being able to move on to a different task. A little timer or some information on a screen would be very helpful. Changing the filament is also not very intuitive as you will need to switch on the 3D printer as if you were starting a 3D print but then cancel it manually and remove the old filament before being able to pull in the new one. To evaluate the performance of the Dagoma Discovery200, we started by printing some Benchys. Sure there are a lot of other options available in terms of 3D models but the Benchy is sort of the “standard 3D model” used to of benchmark 3D printers and evaluate several parameters (surfaces, level of details, overhangs, ….). Also, it’s a cool object that looks nice on a desk 🙂 We printed the first tests with the filament provided by Dagoma, the Octofiber Blue PLA, then switched to the exoric Polymaker PolyWood wood filament. 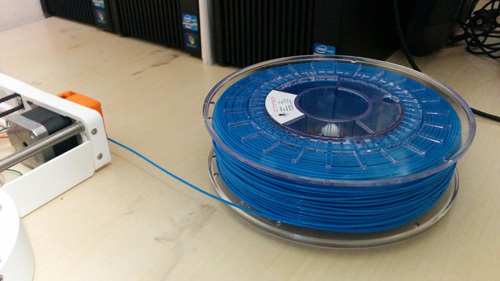 With the Octofiber Blue PLA the results were good when using the 100 microns layer thickness. With the 200 microns layer thickness the print went much faster but some irregularities appeared on the front of the hull, where the overhang is the greater. 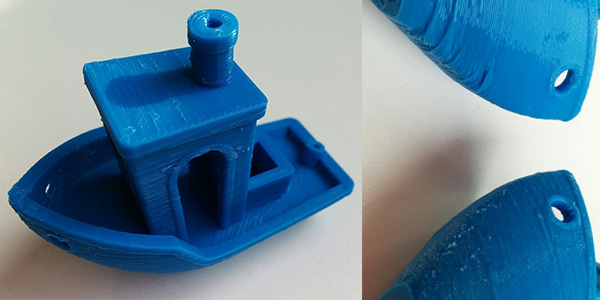 3DBenchy printed with Octofiber Blue PLA. The model on the left was done in 100 microns layer thickness. On the right is a side by side comparison between the 100 microns (bottom) and 200 microns (top). With the Polymaker PolyWood we tried to use an intermediate layer thickness of 150 microns. The result came out amazing! Besides, because this filament tends to fuse more smoothly, the layers are almost invisible and the object surface is almost completely smooth. The overhangs are also amazing, especially for the roof section. 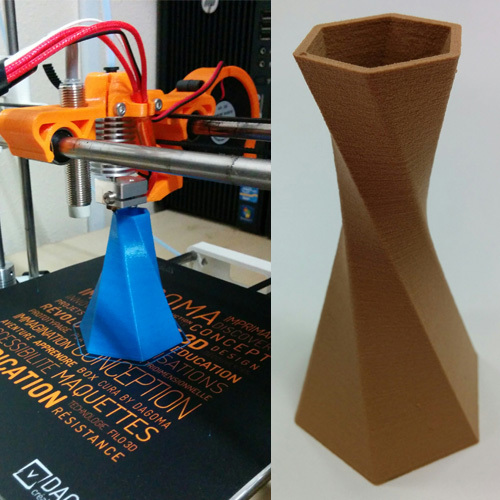 The results we obtained using the PolyWood filament with the Discovery200 were truly is great. 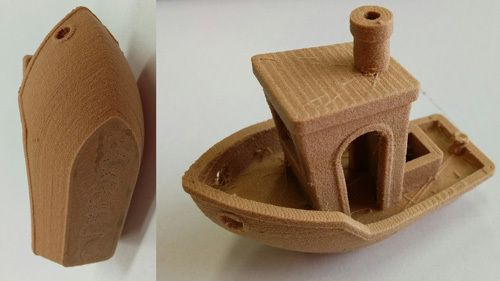 3DBenchy printed with Polymaker Polywood. A nice looking vase, perfect to evaluate the 3D printer ability to print clean and smooth surfaces. 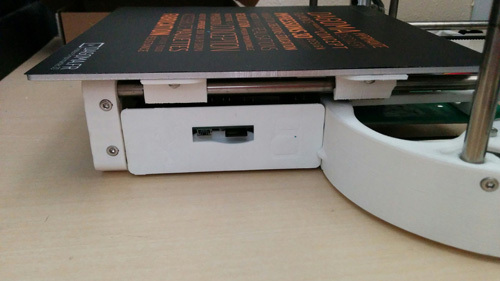 It has a large base so can be hard to unstick from the print bed and can create warping. On this model, the Octofiber 3D print gives a good result, while the Polywood print was again of amazing quality. Twisted Vase 3D printed with Octofiber Blue PLA and Polymaker Polywood. This 3D model is a cool T-Rex skull with complicated overhangs and tiny details (the teeth). We obtained a good quality print with the Octofiber PLA. The Discovery200 is fast enough and the quality of the final print is pretty good, especially for such a big object. 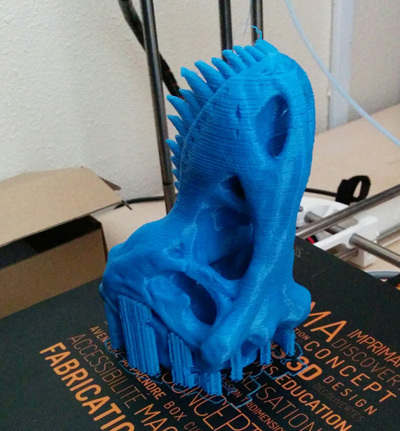 Trex skull 3D printed in full size with Octofiber Blue PLA. This one is a quite useful Nespresso capsule dispenser. 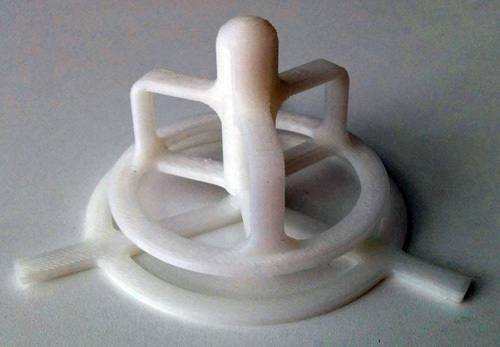 Great 3D model for checking warping issues and how the 3D printer handles big flat surfaces. The quality of the print with the Octofiber PLA was acceptable, but the surface was a bit irregular and some warping occurred. Bottom of Nespresso capsule dispenser. Some warping can be seen. The Dagoma Discovery200 produces high-quality 3D prints in a small build volume. It is however made of 3D printed parts and looks really cheap. The lack of a screen is one of its biggest lack. 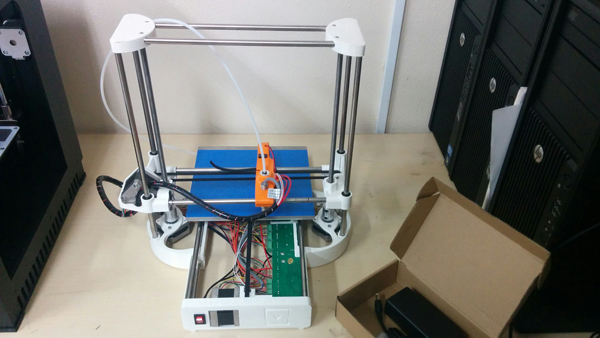 Because of its small price, it is an interesting 3D printer for beginners on a budget. Our overall rating reflects our experience with the Dagoma Discovery200, printing with the Octofiber 3D and the Polymaker PolyWood filament. Bear in mind this is a 299€ 3D printer. 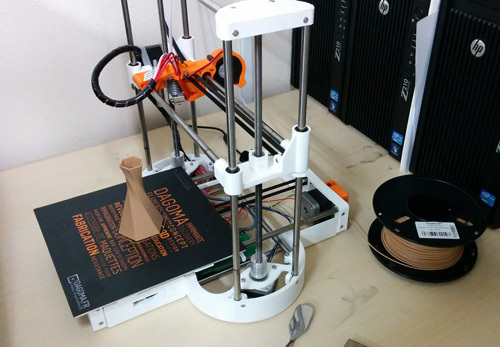 For affordable 3D printing, the Dagoma Discovery200 is definitely an interesting choice. This 3D printer provides really good quality prints but its build and DIY feel make it sometimes tricky to operate and look a bit “cheap”. On the bright side, it is actually really cheap, at €299 for the kit version and 399€ for the assembled one. Once the initial setup is done and you’re familiarized with the printer, the Dagoma Discovery200 is capable of producing really good quality 3D print. However, this printer requires a good dose of know-how and the ability to handle some possible complications (it is a kit 3D printer after all). We do not recommend it as a first 3D printer unless you have prior maker/3D printing experience and are ready to get your hands “dirty”. If you’re not super comfortable with this approach, the Discovery200 has a few competitors which offer more user-friendly experiences. We can think about the XYZPrinting Da Vinci Jr 1.0 and Tiertime Up Mini 2 for example, which both have closed frames and offer a more integrated user experience, where you can start 3D printing almost right out of the box. But the Up Mini 2 is more expensive than the Discovery200 and the Da Vinci may not deliver the same quality of prints as the Dagoma.